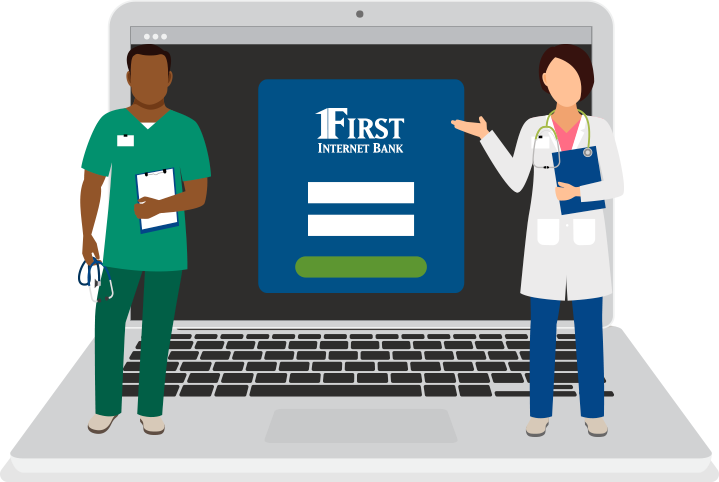 Take the worry out of paying for healthcare expenses and save for your qualified medical costs with a First Internet Bank Health Savings Account (HSA). This tax-advantaged account can be used to pay for doctor visits, prescriptions, dental care and other eligible medical and healthcare expenses. You can also track your account balance and transaction history with free online and mobile banking. And it gives you peace of mind when you have more important things to think about — like your health. Rates last updated 4/1/2019. Rates are subject to change on any day and will be updated by 10:00 AM EST. Please be sure to check this page after 10:00 AM EST for the rate that will be honored today. Fees may reduce earnings on account. The period used to calculate average daily balance is monthly. For additional information, visit our Disclosures page. To be eligible for a health savings account, you must be enrolled in a high-deductible health plan that meets IRS guidelines for the annual deductible and out-of-pocket maximum. Additional eligibility requirements and contribution limits apply. Are you a business owner, interested in providing health savings accounts to your employees?